Leadership style is the manner and approach of providing direction,implementing plans, and motivating people. 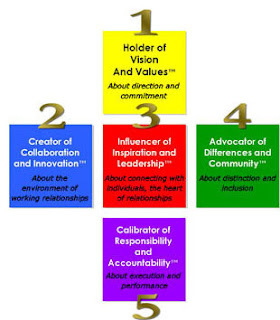 Situation-based leadership is founded on a top-down view of leaderhsip. Traditionally it refers to how you manage people and make decisions. But this view is past its use-by date. When the notion of leadership style was first invented, writers on leadership did not differentiate between leadership and management. Today, we need to recognize that what used to be called leadership style is really management style. Management style is about how you make decisions for your team. The fundamental argument of this website is that leadership means promoting new directions, not managing people. You can promote new directions aggressively, by example or through any number of other influencing styles. Direct appeals using logical arguments and evidence. Expressing enthusiasm and conviction for your idea. Making rousing speaches to large audiences with stirring images and music. Quiet but persistent persuasion over time. Enlisting the support of persuasive others. Asking open questions designed to lead others to your conclusions. Setting an example - the old adage ''actions speak louder than words'' is very true. Unlike conventional notions of leadership, using authority is not a leadership style. Authoritarian (autocratic) This style is used when the leader tells her employees what she wants done and how she wants it done, without getting the advice of her followers. Some of the appropriate conditions to use it is when you have all the information to solve the problem, you are short on time, and your employees are well motivated. Some people tend to think of this style as a vehicle for yelling, using demeaning language, and leading by threats and abusing their power. This is not the authoritarian style...rather it is an abusive, unprofessional style called bossing people around. it has no place in a leaders repertoire. The authoritarian style should normally only be used on rare occasions. If you have the time and want to gain more commitment and motivation from your employees, then you should use the participative style. Participative (democratic) This type of style involves the leader including one or more employees in on the decision making process (determining what to do and how to do it). However, the leader maintains the final decision making authority. Using this style is not a sign of weakness, rather it is a sign of strength that your employees will respect. Delegative(free reign) In this style, the leader allows the employees to make the decision. However, the leader is still responsible for the decisions that are made. This is used when employees are able to analyze the situation and determine what needs to be done and how to do it. You cannot do everything! You must set priorities and delegate certain tasks. This is not a style to use so that you can blame others when things go wrong, rather this is a style to be used when you have the full trust and confidence in the people below you. Do not be afraid to use it, however, use it wisely!